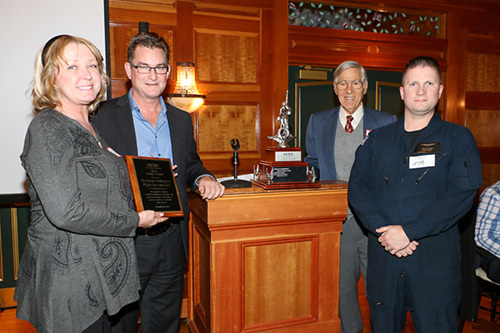 At our 2016 Fall Membership Meeting, our Board of Directors was pleased to present the NEHC Safety Award to Northeast Helicopter Flight Services LLC. The NEHC safety award recognizes individuals and groups for excellence in rotorcraft aviation safety and honors those who have displayed "outstanding service on behalf of safety, whether it be valor, professionalism or service above and beyond normal expectations." 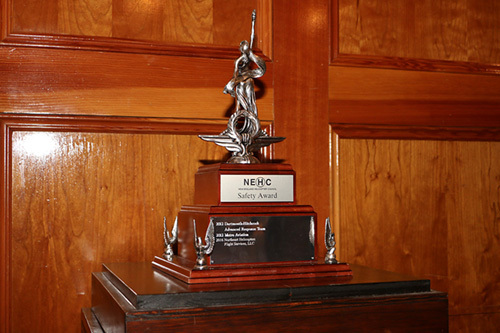 The NEHC Safety Award was 1st awarded to Robert Girouard in 1985 when our organization was known as the New England Helicopter Pilots Association. Since then we have been pleased to recognize a number of well deserving recipients the most recent of which were DHART and Metro Aviation who were recognized for their innovative operating practices and impeccable safety record. Northeast Helicopters is a well-deserved recipient of this award. Owners John and Rhonda Boulette are adherents to a uniform training environment and require that their instructor cadre and students adhere to rigorous standards. The result is a company that produces aviation professionals who are highly regarded by their employers and an organization that has earned an enviable safety record. In summary, Northeast Helicopter Flight Services epitomizes aviation excellence and the NEHC is pleased to acknowledge this organization for its outstanding contribution to aviation safety. Rhonda Boulette and Tim Dunn of Northeast Helicopter Flight Services receiving the NEHC Safety Award.